Extra Show Added: March 2 @ 2 pm! 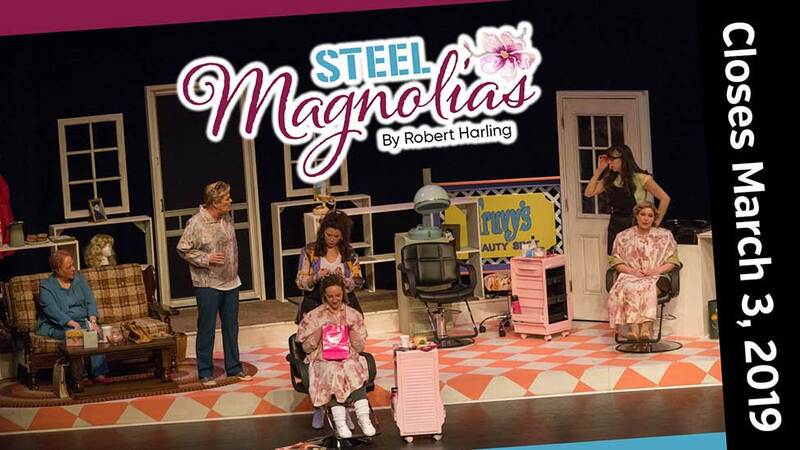 Part comedy of manners, part heartfelt tearjerker, this acclaimed play is set in a small southern town's beauty parlor. Running time: Approximately 2 hours, 30 minutes, including intermission. Kid Friendly: Recommended for ages 13 & up - Please note that children under age 4 will not be admitted. Concerned with a group of gossipy southern ladies in a small-town beauty parlor, the play is alternately hilarious and touching - and, in the end, deeply revealing of the strength and purposefulness which underlies the antic banter of its characters. The action is set in Truvy's beauty salon in Chinquapin, Louisiana, where all the ladies who are "anybody" come to have their hair done. Helped by her eager new assistant, Annelle (who is not sure whether or not she is still married), the outspoken, wise-cracking Truvy dispenses shampoos and free advice to the town's rich curmudgeon, Ouiser, ("I'm not crazy, I've just been in a bad mood for forty years"); an eccentric millionaire, Miss Clairee, who has a raging sweet tooth; and the local social leader, M'Lynn, whose daughter, Shelby (the prettiest girl in town), is about to marry a "good ole boy." Filled with hilarious repartee and not a few acerbic but humorously revealing verbal collisions, the play moves toward tragedy when, in the second act, the spunky Shelby (who is a diabetic) risks pregnancy and forfeits her life. The sudden realization of their mortality affects the others, but also draws on the underlying strength - and love - which give the play, and its characters, the special quality to make them truly touching, funny and marvelously amiable company in good times and bad. "Harling has given his women sharp, funny dialogue... The play builds to a conclusion that is deeply moving." - NY Daily News. "...a skillfully crafted, lovingly evoked picture of eccentricity in the small-town South... " - Drama-Logue.